Last year as I was secretly planning Green Home Experts’ expansion, I met a wonderful guy named Justin Vrany. He met with me in our cramped shop to talk about his plans for Sandwich Me In, a sustainable sandwich shop in Lakeview. His passion and drive oozed out of his pores as we discussed ways to work together. His enthusiasm inspired me to keep working away at our expansion plan. Justin’s dream of creating an eco-friendly restaurant runs the entire gamut. This guys knows what he’s doing! Here are all the wonderful things I remember about Sandwich Me In’s sustainable practices. I’m sure there are more! –Justin used as many reclaimed and repurposed building materials as possible for build-out. 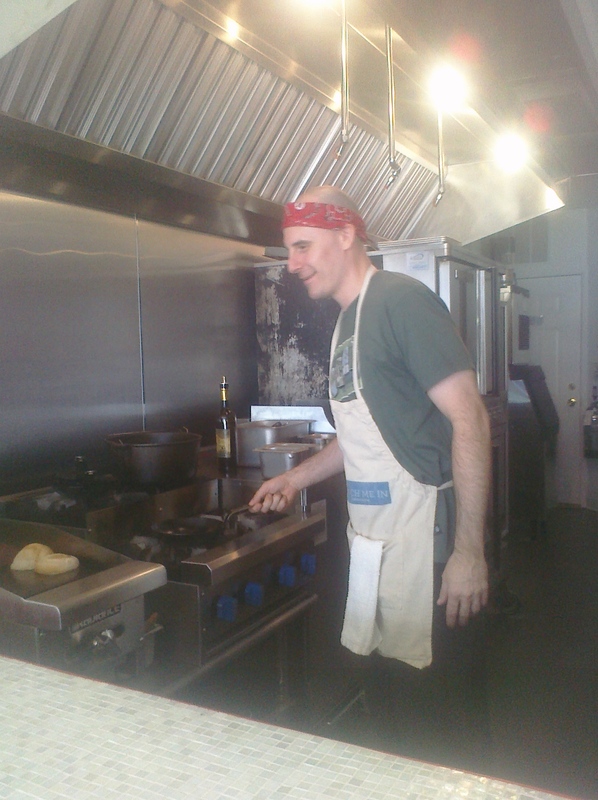 –Justin sources his ingredients locally and from organic farms. –Sandwich Me In is this/close to a zero waste restaurant. They recycle everything they can, including packaging waste and other materials that are difficult to recycle. –All food waste is picked up by a service that brings it to a commercial composting facility. –Delicious sodas are made in-house using SodaStream soda makers (furnished by us, of course!). –Sandwich Me In only uses biodegradable and compostable food service products (furnished by us, of course!). –Sandwich Me In’s cleaning supplies are non-toxic and biodegradable (furnished by us, of course!). On Thursday I picked up lunch for the GHE staff at Sandwich Me In. I loved the pulled pork, which Justin told me they smoke for 13 years. And he uses an old family recipe for their barbeque sauce! Delicious. It’s been an honor and a pleasure to work with Justin, and I look forward to working with him for years to come! Make sure to visit next time you’re in the neighborhood. Learn more about Sandwich Me In and follow their progress on Facebook and Twitter @sandwichmein. Definitely a place to treat the family next time visiting my very urban son. :) They will love it…me too! Thanks! I suppose the meat would become a bit dry, don’t you?